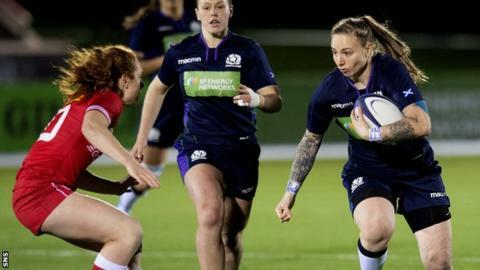 Scotland's players have shown a "pretty positive" reaction after he called them out following defeats in their opening two Women's Six Nations matches, says head coach Shade Munro. The Scots lost to Italy and Ireland - both at Scotstoun - and now face 2018 champions France on Saturday. Munro said they met the day after the Ireland game to discuss the defeats. "Honestly? It was a bit subdued when they came in through the door, but that's all changed," he said. "I called a few people out on a few things. A coach can shout at people for not doing x, y and z, but it's the standards that they set. If they drop below them, it's your job to not to let them away with it. "So they feel sorry for themselves a wee bit. But, ultimately, what are you going to do about it? You have to address it. And they've been pretty positive since then." Munro has made four changes to his XV to face France, with influential number eight Jade Konkel returning from injury. Nicola Howat replaces Deborah McCormack in the second row, Sarah Law comes in for Mhairi Grieve at scrum-half, and Rhona Lloyd starts on the right wing as Liz Musgrove has had to return to work. "That is the nature of the women's game," Munro said of Musgrove. "We tried to rip up her plane tickets before she could go back... but we knew she had to go back to Hong Kong." Scotland now face a France side looking to bounce back from a 41-26 defeat by England in the second round. Munro's team have lost their last five Six Nations matches against the French with an aggregate score of 216-3. "It's a challenge-and-a-half playing against France, there's no two ways about it," Munro added. "But that was a really good session we've just had there. It was buzzing, there were smiles on their faces, which was good to see." Scotland team: Rollie; Lloyd, Smith, Thomson, Sergeant; Nelson, Law; Cockburn, Skeldon, Kennedy, Wassell, Howat, Bonar, McLachlan, Konkel. Replacements: Rettie, Dougan, Forsyth, Winter, McCormack, Maxwell, Martin, Evans.